"Do you have any weapons that make undead explode when you hit them?" Tall and imposing, Aenin is the consummate fighter. His parents died at a young age somewhere in the Great Dale. He was taken to Phsant (in Thesk) by an unknown party to be raised by his uncle, Kenji Komura. He was trained at a young age by Kenji in the tactics and psychology of battle. He developed his talents quickly and felt the constant need to test his skills. 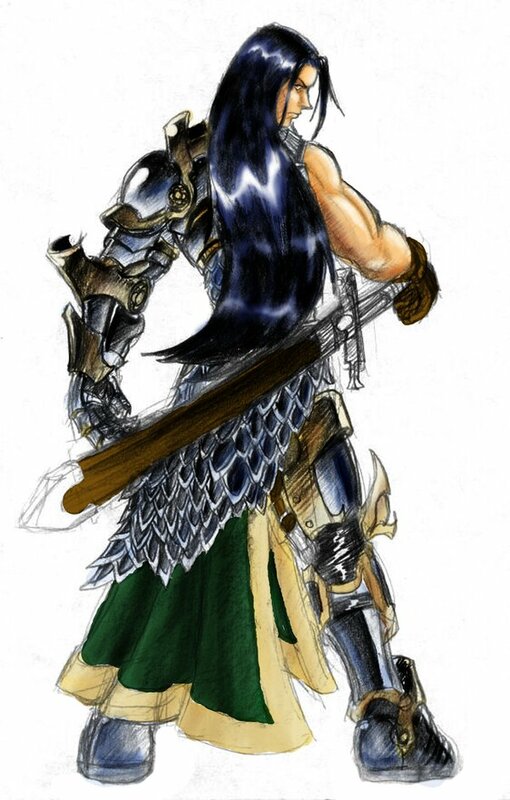 Aenin was also trained in armorsmithing and used this ability to create a unique kind of buckler, a pauldron (*see stats in gear page). This armored sleeve extends from wrist to throat in thick metal plates. His peers saw him as somewhat eccentric when he first presented it, but after seeing it in action they quickly changed their minds. The constant temptation by the local gangs was beginning to prove too enticing to the young warrior; he would venture out in the night with some of the local hoods with plans on fighting rival gang members. Aenin really didn't care what the brawls were about, just that he was able to do some proper fighting. When his uncle discovered his nocturnal jaunts he threatened to take away the ancestral daisho he gave Aenin and forbid him from leaving their shop. When Khalia came to town with the PCs in tow, Kenji saw his opportunity to get his nephew away from a life of crime. And so it was, Aenin joined the small group of adventurers and headed out for Telflamm. Aenin Komura (Fighter lvl 2, Warblade lvl 5) stands at 6'6", head and shoulders above most people, let alone his immediate family who are of Kozakuran decent. One of his parents (his father) was Rashemi, possibly one of their infamous berzerkers, which explains Aenin's fantastic height and his green eyes.